On May 4, AMC Entertainment held their first annual charity event benefiting Variety - The Children's Charity & The Will Rogers Institute with a special performance by music icons, Pat Benatar and Neil Giraldo. Held at Fox Studios in Los Angeles, the event included Kansas-City style BBQ from the famed Fiorella’s Jack Stack, Heineken, Crane Lake wines, Jack Daniels and Skyy Vodka cocktails and games such as horseshoes, Texas Hold’em and a strong man mallet competition. Celebrity guests included: Gilles Marini (“Brothers & Sisters”), Tichina Arnold (“Everybody Hates Chris”), Rich Sommer (“Mad Men”), Shar Jackson (“Moesha”), Yvette Nicole Brown (“Community”), Steve Ward (“Tough Love”), BooBoo Stewart (ECLIPSE), Gregory Michael (“Greek”), Jennifer Stone (“Wizards of Waverly Place”), Kayla Ewell (“Vampire Diaries”), Jes Gordon (“E!”), Karl Yune (MEMOIRS OF A GEISHA), Sean Patrick Flanery (Boondock Saints), Aimee Garcia (“Trauma”), Kaycee Stroh (HIGH SCHOOL MUSICAL), Tim Mosher (Composer – “Craig Ferguson”), Logan Miller (“I’m in the Band”) and Tami Farrell (Miss California 2009). When the legendary Ms. Benatar took the stage, Kayla Ewell started a mosh pit in the front row, while Yvette Nicole Brown utilized her Flip phone to record almost every song Pat Benatar performed, adding, “I need to get my Pat Benatar on!” while sporting double Texas bull horn hand signs. 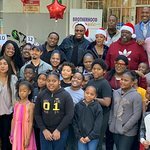 Other highlights of celebrities enjoying the festivities included Steve Ward who impressed himself with his strength at the strong man mallet competition and Tichina Arnold who lip-synced every one of Pat Benatars songs. But perhaps the most original show of support came from Sean Patrick Flanery who created a crowd by dancing a country hoe down as Benatar thrilled the crowd.